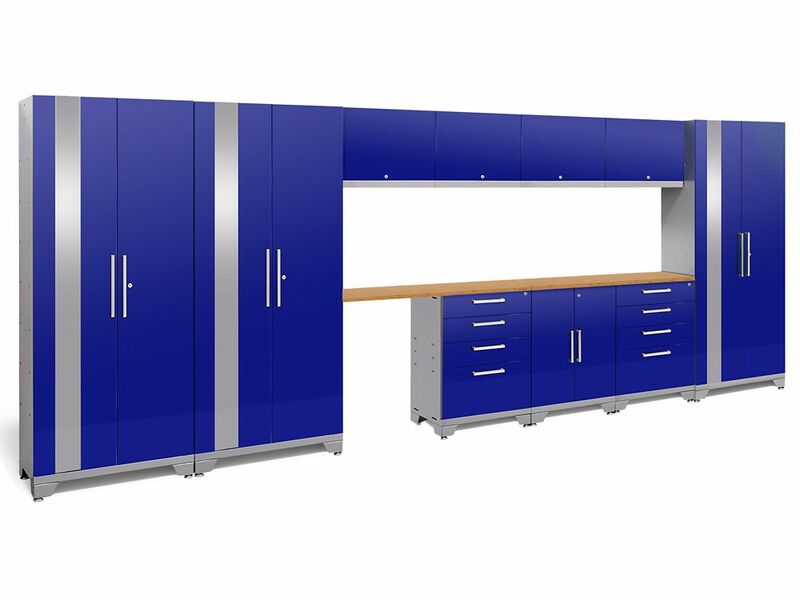 Performance 2.0 Storage Cabinets in Blue (12-Piece Set) Get all those cables, decorations, and gardening tools off your garage floor and into NewAge Products newly redesigned, Performance 2.0 Series modular garage cabinetry. These cabinets are built to last with their fully welded, 24-gauge steel frames and fully lockable, double walled doors. Our configured sets are shipped with adjustable steel shelving; easy-to-grab stainless steel handles and height adjustable leveling legs that accommodate uneven garage flooring. The manufacturers limited lifetime warranty gives you the insurance that your cabinets will look great for years. Performance 2.0 Storage Cabinets in Blue (12-Piece Set) is rated 5.0 out of 5 by 4. Rated 5 out of 5 by ehkolie from Very Impressed Never received a product before that was so well packed for delivery. When I saw that, I knew I had made a good choice. Instructions for assembly were clear and hardware was individually labelled and shrink wrapped. Easy to put together. No issues with the gauge of metal used once finished. Strong and stable.